Brussels sprouts are one of my favorite vegetables. The dreaded, scary vegetable of childhood that most adults don’t try because of it’s reputation. That reputation is ill earned, my friends. I’ve always been a veggie lover, and while I never had brussels sprouts as a child, I was anxious to try these beautiful baby cabbages when I started to explore cooking more on my own. I’ve had so many people tell me they didn’t like brussels sprouts- until they tried mine. I think the ill-got reputation comes from how many vegetables were prepared years ago –> Boiled. With salt. Until they were dead. Yuck. I wouldn’t have liked them either. I actually do steam them occasionally, and have a really awesome recipe for a steamed brussels sprout salad I’ll share closer to Thanksgiving, but my favorite way to serve them (and SOO easy!) is roasted. Slice off the end, cut in half, toss with a bit of olive oil, salt and pepper on a baking sheet, done. Beautiful, slightly crispy, still fresh and a bit crunchy in the center, roasted vegetables. This dish is a stunner. Beautiful enough to serve for guests, especially during this holiday season. It would make (and probably will make) a festive appearance on the Thanksgiving or Christmas table. That’s not what I whipped these up for last week. It wasn’t even for dinner. I made these, photographed them, and then packed them away for my lunches at work. It took barely any time, and I love having healthy, fresh, beautiful food that I look forward to eating come lunch time. On Fridays, I go out to lunch with my colleagues. I ordered coffee, enjoyed a nice walk and chat with my friends, and then came back and ate these (and some left over chicken) for lunch. That’s why I think it’s worth putting a bit of effort into making nice meals for myself at lunch. I learned a trick a while back for easily removing the arils from a pomegranate. Have you ever peeled one, and ended up with little dots of deep ruby juice ALL OVER THE KITCHEN? On your clothes? (Apparently, I’m guilty!). I’ve learned the best way to attack this task is under water. 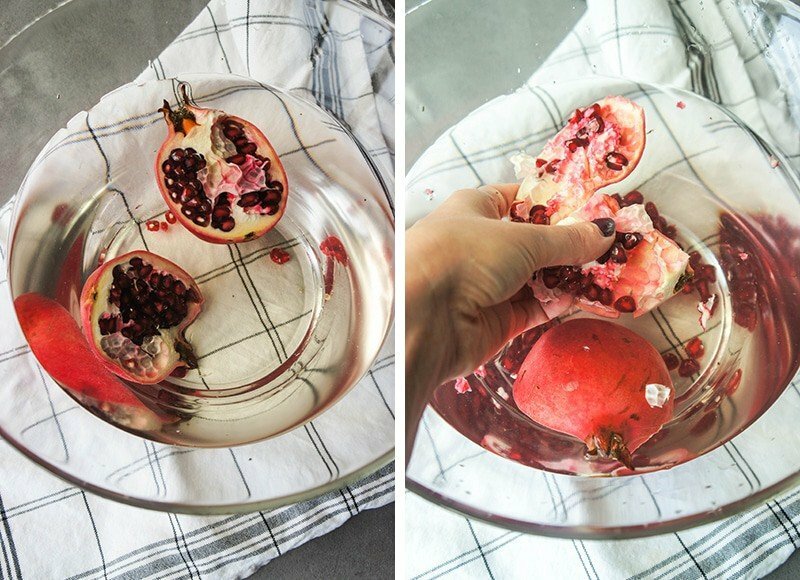 Fill a bowl half way with water, score the skin all around the pomegranate, and then submerge it under water while gently pulling the two sides apart. Then, use you fingers to break away the white pith and separate the pom arils. The pith will float, and the arils will sink to the bottom. One pomegranate yields a lot of arils. I am always amazed by how tightly packed in they are. A large pomegranate is enough to sprinkle over quite a few salads or yogurt bowls. 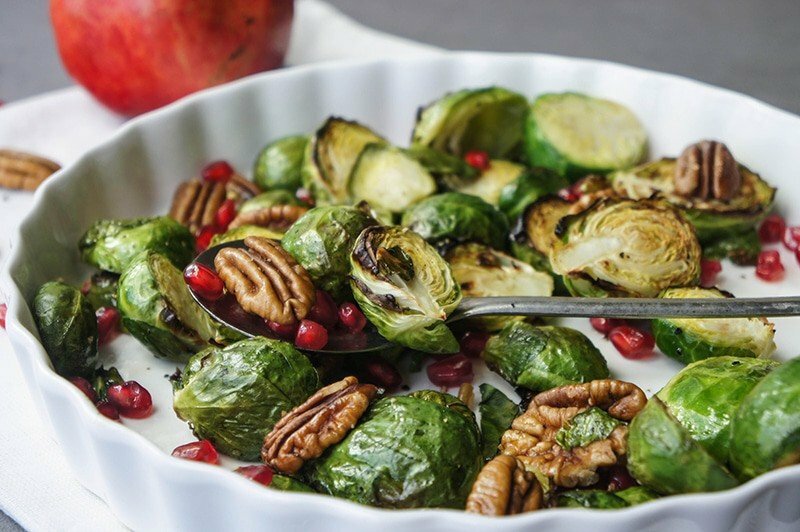 Brussels sprouts are roasted until crispy on the outside, and still slightly crunchy and fresh on the inside, then dressed up with pomegranate arils and pecans. Perfect for a holiday meal-- but simple enough to make for any meal! Preheat the oven to 450 f, or broil on low. Cut the ends off the brussels sprouts, and clean off any leaves that are wilting or eaten by bugs. Slice in half. In a baking dish, add brussels sprouts, then lightly coat with olive oil and honey, and season with sea salt and pepper. Bake on a rack near the top of the oven for the most crispy leaves. Bake for 12 minutes, until brussels sprouts are browning on the outside, but not overly cooked. They should maintain a bright green color. Add the pecans, and continue to bake on a lower rack in the oven for another 3-5 minutes, being careful not to burn the pecans. Alternatively, toast the pecans separately and add them in. This might be a good idea if you're preparing these for a holiday dinner while there's a lot going on in the kitchen to prevent forgetting about them! 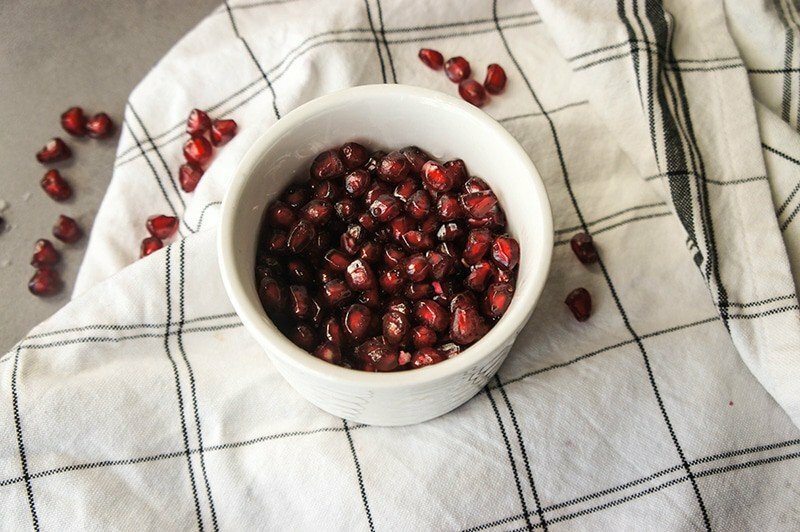 Allow to cool for a few minutes, then toss with lemon juice, and sprinkle the pomegranate arils over the top. 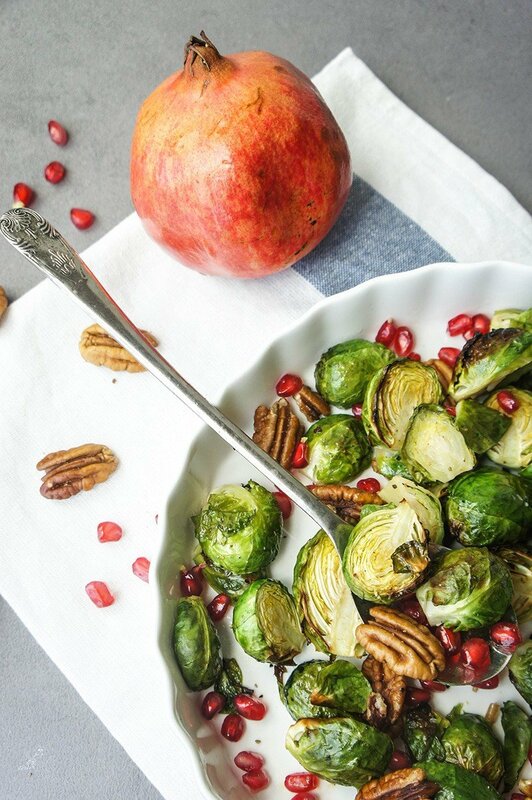 Roasted Brussels Sprouts and Apples Salad, by betsylife. The fact that you called this dish a 'stunner'- I'm glad we've connected. We will be fast mates!So true about brussels sprouts- they got such a bad wrap as a kid! Please tell me they are well priced for you there! What a splendid combination of diet healthy and nutritious flavors. I think I add pomegranate arils to just about everything I make, no lie! My kids gobble them down like there's no tomorrow. And brussel sprouts are on sale this week too.....and I love them as well. Pecans are the perfect nut to add to this dish. Classic. And I done the water trick with pomegranates too and it totally works....although sometimes, I like to "fight" the pomegranate too and pluck with my fingers. hah. I never turned back once I tried breaking them apart under water! It's so much faster (and cleaner!). This combination of ingredients is one of my all time favorites!! Now I'm craving this recipe :) Pinned! Thanks Marla! Yes, 3 very good ingredients this time of year. I love it when the poms start showing up! You are right - this is indeed perfect for the holiday season! 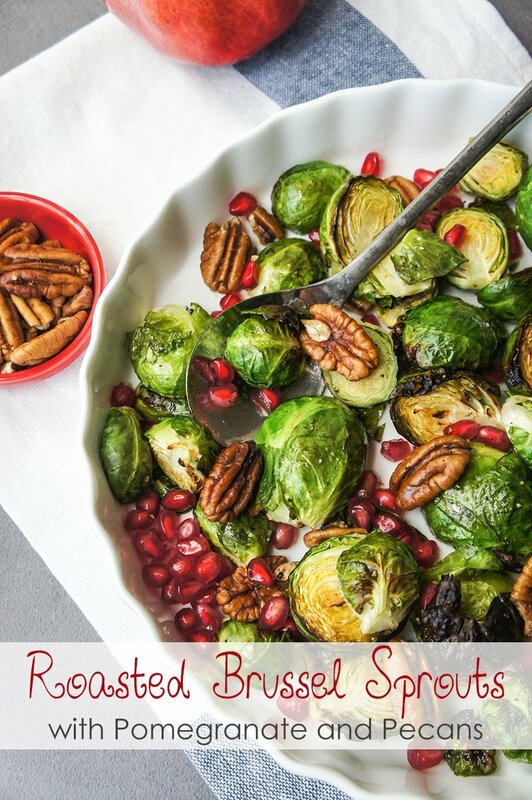 As a brussels sprouts lover - I am totally digging this combo with pomegranates! Brilliant pairing! So glad I stumbled by!!! These look absolutely delicious! I love Brussels sprouts as well, but this recipe of your's looks even more divine than they usually are. Must get my hand on some fresh ones soon, along with a pomegranate. Too delicious. Thanks Rachel! It was a really delicious combination. And so beautiful, who could resist? They are the dish I always volunteer to make also! This just might replace the cold brussels sprouts salad I normally make- although I like that recipe because its best made the day ahead, and doesn't even need reheating! Saves oven space the day of. This looks amazing! Thanks for the SITS Sharefest recipe. Pinned! (And so making this when I get back home from traveling)! I hope you enjoy it! I love dressing up Brussels sprouts, and eat them all the time throughout the colder months. Glad you stopped by! These brussels sprouts look SO delicious Michelle. I love brussels sprouts and am always looking for new recipes and ways to kick up their flavour - so I definitely will be recreating this recipe.. and adding some smoky pancetta I think!